There’s nothing wrong these days, thankfully, with finding your other half on the internet. 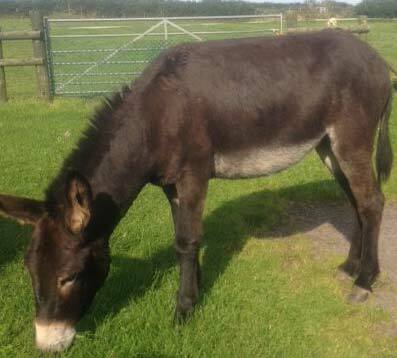 And that’s just how, after Googling ‘donkeys’ and ‘Wales’ I was introduced to Mali the donkey. I visited her in early January, and she was not very keen on me, but her owner assures me that she is just young, and a little training between now and May will go a very long way. And then she will be happy to go a very long way. Her owner recommended Mali (which rhymes with Sally, and is the equivalent of Molly in Welsh) because she is a big, strong, three-year-old donkey. Too strong to carry kids along a beach without possibly scaring them, she’s currently mostly hanging out with the other donkeys, but is in need of some fruitful work to keep her occupied. Her owner reckons she’ll really take to walking, will enjoy the other people we meet on the way, and will have no trouble with fifteen-mile days: “She can do fifteen miles, standing on her head!”. 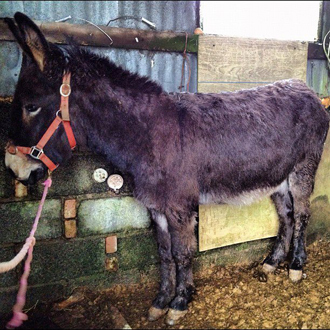 I’m also hoping that she’ll be faster than the average donkey, on account of her greater size and energy. The average donkey goes at around 2.5km an hour, and I think I probably walk at around 4km an hour (at a total guess). It’s tough walking below your natural gait, so it will really help if she’s a quick ‘un. Her owner tells me that Mali doesn’t go in for Polos, and doesn’t like having her ears touched (this one I noticed for myself when she flinched as I touched an ear five seconds into our first meeting, after her owner and the owner’s uncle had finally managed to get her under control. Gulp). She does like apples and horse treats, and people – I’m assured. Judging by her other donkeys, she may freak out when she first encounters puddles and white lines in the road, says her owner. She’s a beauty, a real handsome jenny (female donkey), and I will be proud to be seen with her, provided she doesn’t mind coming along with me. Or… I will be unable to be parted from her, and will have to leave London and get a field, and start planning the walk around the rest of Britain, or the Med, or the world – mwah ha ha haaaa. Even if I do give her back, donkeys can live for fifty years, and have amazing memories; they can remember people and places for up to 25 years. Provided we get off the starting blocks, this could be the beginning of something beautiful.